Researchers announced encouraging developments across several critical areas of HIV research at an official press conference at the 9th IAS Conference on HIV Science (IAS 2017) today. These included a promising vaccine candidate, positive results for an innovative HIV treatment option and better strategies to combat co-infections. The briefing also featured the results of a rigorous new survey in Swaziland – which has the world's highest HIV prevalence – showing the extraordinary national impact of expanded HIV prevention and treatment efforts. 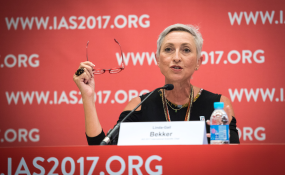 "Each of the studies we are highlighting today takes us one step closer to the end of HIV," Linda-Gail Bekker, the International AIDS Society (IAS) President and International Scientific Chair of IAS 2017, said. "This research moves us forward on many fronts, from vaccines, to new treatment approaches, to real-world evidence that our current efforts to expand testing and treatment are paying off." Results from APPROACH, a Phase 1/2a study evaluating seven different "prime boost" HIV vaccine regimens, identified a promising vaccine candidate that will be evaluated in a proof-of-concept efficacy study among those at risk for HIV. The APPROACH study included 393 low-risk, HIV-negative adults in the United States, Rwanda, Uganda, South Africa and Thailand. The current "gold standard" treatment for cryptococcal meningitis is amphotericin plus flucytosine for two weeks, but this regimen is often unavailable in low-income countries. Sile Molloy of St George's, University of London presented results from the ACTA Trial, which explored two new strategies that could be both sustainable in Africa and more effective than fluconazole, which is most commonly used in resource-limited settings: short (one week) induction with amphotericin-based treatment, and oral therapy of high-dose fluconazole plus flucytosine. Overall HIV incidence in Swaziland dropped by almost half (46%) from 2011 to 2016 as the country scaled up a comprehensive, national HIV prevention and treatment programme.This is according to a rigorous survey intended to directly measure the impact of the programme. Italso found that the proportion of people living with HIV who have achieved viral suppression doubled (from 35% to 73%). TAC ANRS 12311 is an open-label trial assessing the feasibility, efficacy and safety of treating HCV-infected patients in sub-Saharan Africa with interferon-free, direct-acting antiviral therapies. The trial included 120 participants with treatment-naïve chronic hepatitis C in Senegal, Côte d'Ivoire and Cameroon; 32 participants were co-infected with HIV. Patients without decompensated cirrhosis received a 12-week combination of sofosbuvir plus weight-based ribavirin (if infected with genotype 2) or sofosbuvir/ledipasvir (if infected with genotypes 1 or 4).